Slayer drummer Paul Bostaph started out rapping drumsticks on pillows in his bedroom at age 15. By his 16th birthday, he earned a drum set with a high hat and was learning AC/DC songs. That’s when he knew the direction his life would take him. 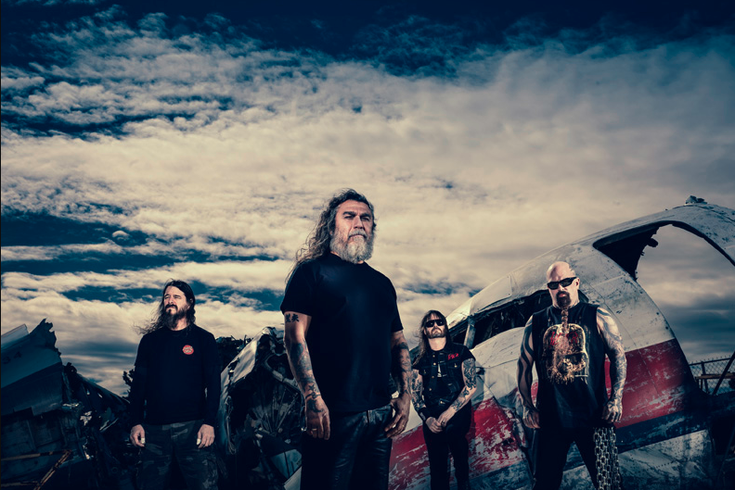 PhillyVoice bent Bostaph’s ear before Slayer plays Sunday at the Electric Factory outdoors and learned a few things about the band that is considered one of the “Big Four” in thrash metal history, a stage some critics say they share with Metallica, Anthrax and Megadeth. Bostaph, born in Pittsburgh but raised in northern California, has been with the band on and off since 1992. PV: I think it’s fair to say you’re widely considered one of the best drummers of all time. Who are some of your biggest influences and inspirations? PB: Wow, that’s a big stretch. There are a lot of great drummers out there. The list is many. To name a few, Tommy Aldridge, Nicko McBrain, Clive Burr, Buddy Rich, Phil Rudd, the list goes on and on. PV: What’s the best Slayer song you ever recorded? PB: It would have to be “Gemini.” I just like that song because it was the slowest Slayer tune I ever recorded, and there was so much empty space in that song and the verses were pretty much dive bombs. And there are a lot of breaks in that song. A lot of the drum parts are improvised. It was just fun. PV: How are you guys able to maintain the original Slayer image while still keeping fresh with young audiences? PB: I don’t know what the original Slayer image is. We’re still Slayer. I don’t think it’s ever trying to keep up an image … the band – over its career – has never compromised its sound and doesn’t compromise at all. That’s who we are and that’s just kind of a way of life with this band. It's doing it the way we want to do it and I think for any good band, that’s what you have to do and I think if that’s really where you’re at, then I don’t think that sentiment ever gets old. So, I don’t think it’s a matter of reinventing yourself, it’s a matter of staying true to who you are. I think it transcends generations. That’s why your favorite bands never let you down … Because I left the band, I was able to see the band as a fan and then back in it as a drummer – then as a fan and then as a drummer again, which is a very interesting perspective. The band doesn’t compromise and I think that’s what keeps it fresh. PV: Are any of your songs about something totally unexpected, like unicorns or kittens or spending time with your family – something average listeners wouldn’t come to expect? PV: Who does the best cover of a Slayer song you’ve ever heard? PB: One that really stood out to me was Tori Amos. She did a cover of “Raining Blood” and it is awesome. You really won’t even recognize the song. It was amazing. I remember listening to it with Jeff [Hanneman] and thinking, ‘Is this the same song?’ Tori Amos is incredibly talented. She definitely took that song in a different direction. PV: You’ve played with Forbidden, Exodus, Systematic, Testament and other bands. Who’s been your favorite to work with? PV: How’s Tom Araya’s neck? Can he ever head bang again? PB: Tom’s neck is fine. I think for Tom, he would love to be head banging, but the reality is that sometimes, you’ve got to take care of what you’ve got. If you watch videos of Tom, I’m surprised his neck doesn’t fly off. He head banged hard back in the day. And to a certain degree, those kinds of injuries you get, I mean, they can be unprecedented in music, but with this genre [of] music, I don’t think your head is supposed to naturally be – it’s like you’re getting into a 25 mph car wreck and getting hit from behind all the time. Eventually, something’s going to give unless you’re lucky. It’s not something the body is supposed to be doing. Tom would love to be head banding, but you know, we all do it for him, so it’s no big deal. PV: Turning to a sad note here, but I have to ask. The loss of Jeff Hanneman. Was his death the biggest blow to Slayer in its long, storied history? PB: Well yeah, that’s a given. Jeff was a friend, a brother, a bandmate. Any time you lose a friend or somebody close to you – I mean, we’re also family, so that’s a huge blow. Death is the hugest blow that can ever hit anybody. It’s not like the guy went on vacation. PV: We’re very much looking forward to your arrival in town. Is there a must-stop place to visit when you come to Philly? PB: I haven’t gone out in Philly too much. But the S.S. United States. I want to see that ship. I’m a huge fan of the old steam ships and I want to see that. That would be the one thing. PV: If you could play one more show, what city or venue would it be in and what song would you end with? 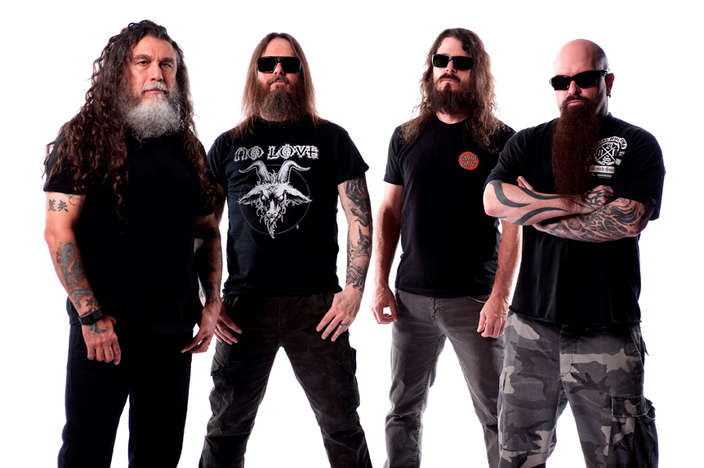 Catch Slayer Sunday, July 23 at the Electric Factory outdoors. Click here for more information.